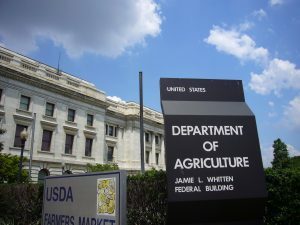 The U.S. Department of Agriculture’s proposed 2018 budget includes a 20 percent cut in the agency’s discretionary spending. The proposed cuts include a reduction in money for agricultural research, reduced food aid for the poor, and slimming down programs that benefit small rural communities. The budget also proposes new restrictions on government-subsidized crop insurance. The broad outlines of this budget had been released two months ago. The budget cuts are part of President Trump’s 10-year plan to eliminate the federal deficit. Trump’s long-term proposal is to cut $230 billion in farm bill funding over the next 10 years. The budget proposes reducing funding for the Agricultural Research Service by $360 million, or 26 percent. It is estimated that a cut of this magnitude would result in the closing of 17 research centers. Proposed restrictions on the SNAP program, which helps the poor buy food, would cut spending by $4.6 billion in 2018, increasing to more than $20 billion annually by 2022. The country’s flagship program of international food aid, called Food For Peace, would be completely eliminated, saving the government $1.7 billion. The crop insurance proposal would cut government subsidies for the programs by more than $2.5 billion each year and limit the ability of large farmers to take advantage of those programs. The proposal would limit the insurance premium subsidy to $40,000 for any single entity and target crop insurance to producers that have an adjusted gross income of $500,000 or less. The budget would also eliminate harvest price revenue coverage. Crop insurance insures farmers against losses if their crops are destroyed by natural disasters like hail, drought or flooding. Another type of coverage insures against low market prices. If the new budget makes crop insurance more expensive, more farmers could decide to buy less coverage or completely go without it. Sen. Debbie Stabenow (D-MI) called the budget proposal “harsh and short-sighted.” The American Farm Bureau Federation said in a statement that “this budget fails agriculture and rural America.” Zippy Duvall, American Farm Bureau Federation president, said, “USDA cuts of this magnitude in the current economic cycle would be unwarranted and unwise.” The American Soybean Association and the National Corn Growers Association also voiced criticism of the plan. The farm economy is now in its fourth consecutive year of declining net income. Estimates from the USDA forecast net farm income of $62.3 billion in 2017. That is roughly half of the record $123 billion farmers earned in 2013.